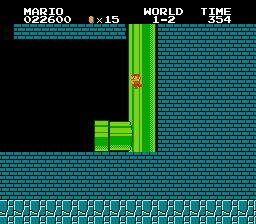 NES Super Mario Bros. (JPN/USA PRG0) "warps" in 04:57.33 by klmz. Here at TASVideos we make perfect movies. And then we beat them. This improvement comes from a trick to save a mere half a pixel when accelerating from a stop. This trick allowed just enough to beat the 21 frame rule in 8-2 and save a frame in 8-4.